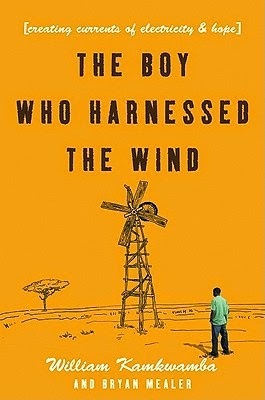 The Boy Who Harnessed the Wind is one fine book that I strongly recommend. It is the story of William Kamkwamba, born into a rural family that depends absolutely on farming to remain alive. They survived the most devastating Malawian food crisis ever. However, he had to drop out from school, primarily due to lack of food and lack of resources too. In the throes of dearth, William, at the very tender age of fourteen longing to be educated, frequented the village library. From a photograph and a text book he built an electricity producing windmill with recyclable materials and spare parts, most of which he collected from the pile of garbage in his village. Few years later, as luck would have it, through the Malawian Newspaper he was featured in the blogosphere through which he caught the attention of TEDGlobal. And, hence, he gained international fame. This is one book everyone should read, it is encouraging and inspiring, it should be in the library of very school and should be translated into as many languages as possible. Nothing is impossible, you just have to try. Kudos to Bryan Mealer for doing a wonderful job in reference to the writing of the book. I have to admit that I am late in the reading of this non-fiction since its publishing in 2009. It was a phenomenon of a book. A lot has been published about William Kamkwamba, below are some official links. This book won the German Corine Literature Prize. As I have already said, I highly recommend. Thank you to the MS/HS Library for lending me this book, now I can kindly take it back after having it for so long. Definitely a good book. I loved all the details about how he figured things out. Thanks for the link to his blog, it was interesting to see what he has been doing recently. Very nice. I will look into this book! Yeah, it really worth reading! Wonderful review, Certainly a book worth the read.